Ahead of the Drum's first ever Digital Trading Awards awards sponsor MediaMath's chief revenue officer Erich Wasserman talks about what it will take to make the programmatic trading ecosystem continue to thrive and grow. As digital ad spend continues to grow through programmatic channels, the corresponding growth in ROI is shining a light on the many advantages of programmatic marketing. As a result, forward-thinking brands are now looking to understand the role that ad tech should play in their marketing organisations. With greater investment in digital display from larger brands, expectations are for higher-touch, higher-levels of service with more autonomy over data insights and media buying decisions. This trend is leading to many brands considering direct technology relationships, and a number are now working directly with a technology platform to buy media programmatically. The trend is motivated by a variety of considerations. For example, by tying first-party data to programmatic media buys, brands stand a better chance of reaching the users they wish to target, and also gain more control and understanding of that first-party data. There are also the advantages of improved integration with internal systems, and normalised measurement capabilities across a range of disparate media and campaign types. Unsurprisingly, this trend has caused some in the agency space to feel unsettled. Media scaremongering positions ad tech companies as attempting to disintermediate agencies, which – from our perspective – is absolutely not the case. To the contrary, some of the most successful relationships within our global business relies on the brand and agency relationship thriving – leveraging insights, availing themselves of deep ecosystem integrations, and growing and optimising spend based on the outputs of a strong platform. Indeed, for all constituents, this is not a matter of ‘either…or’, but is instead a ‘yes…and’. Brands continue to leverage agency partners for their inimitable trading best practices, cutting-edge tools, and pooled media buying and data expertise. Agencies create new opportunities for brands with the use of programmatic technologies, which create new opportunities for proprietary modelling and optimisation capabilities, data-driven creative services, and more. It is a fact that most of our larger direct brand clients have their agencies centrally involved in the planning, execution, measurement and/or optimisation of their marketing programmes. Those that do not – e-commerce brands, for example – did not have media agencies in the first place. In each of those cases, the agency has been able to extend their value proposition by combining their strategic intelligence and market power with the technology offered by ad tech firms, an approach that offers maximum benefit to the advertiser. 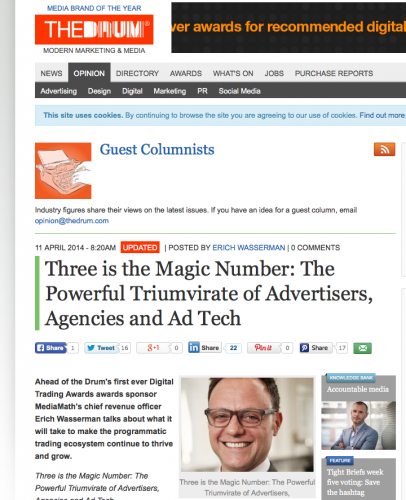 In this triumvirate of advertisers, agencies and ad tech lies a collaboration of strengths that will enable brands to capitalise on the fast-paced, ever-evolving world of digital marketing. Neither player can succeed independently – three is the magic number.